Complete information on the functionality provided by Shale Remoting may be found in the Javadoc package summary for this module. In particular, you will want to review the mechanisms for conditionally enabling access to resource identifiers for each processor, and what the default persmissions are. We get the username field's value from the corresponding request parameter and validate that value. 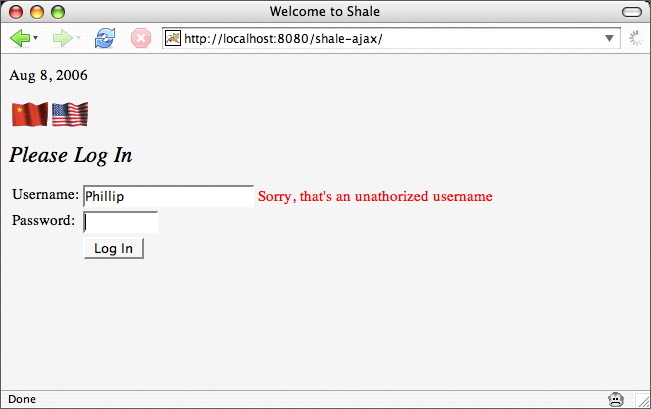 After Shale invokes the validateUsername method, it short-circuits the JSF lifecycle so that JSF does not render a response. Note: The ResponseFactory class is part of the Shale remoting package. See the javadocs for more information.